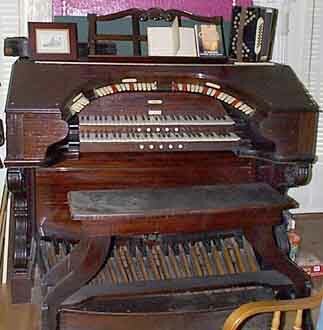 Mr. Charles Ayars, the original owner of this WurliTzer Pipe Organ and the home in which it is installed, built an addition to house the instrument and its "working parts". The Organ has two consoles. The mahogany horseshoe console in the living room has two manuals, "solo" and "accompaniment", and pedal board. It is controlled with electro-pneumatic action. For example, one has only to press a button on the console to change over to the player. The beautiful automated mahogany player console in the reception hall resembles an upright piano and controls the pipes by rolls, like a player piano. The rolls also control the key action, registration and swell pedal to perform exact shades of expression used by the artist who played for the roll. The organ is equipped with a limited toy box and approximately 12 ranks of pipes located in the pipe chamber behind a white enameled grill and draperies in the living room. The blower and low frequency generator for the operation of the instrument are in a chamber sunken under ground outside the house. layout and text edit © 2000 jen 0218 . . . Text and Photos © Dave Jafolla . . .